Sightings of 'monster' fish in Lake Washington have sparked rumors and wonder for decades. Rumors have swirled for decades about sightings of prehistoric creatures and monster fish, even sharks, in Lake Washington. But biologists have a simpler explanation for the 'Lake Washington Monster' — and it's really big sturgeon. A recent sighting caught the attention of the Cochran family in Kenmore. Back in July, the family was on their dock at the north end of Lake Washington, when they spotted three surprisingly big fish swimming just below the surface. Jennifer Cochran snapped photos and video of the creatures while her husband and kids marveled at their size. 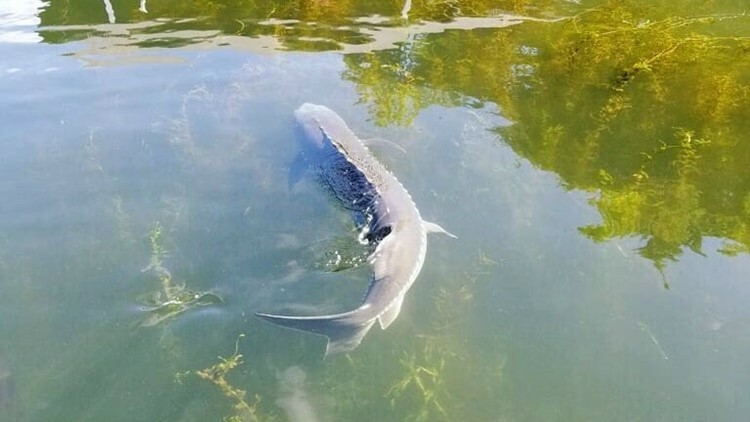 Washington Department of Fish and Wildlife District Biologist Aaron Bosworth inspected the footage and identified the fish as white sturgeon, about 6-7 feet in length. "That is a pretty big fish for Lake Washington, but not for sturgeon in general," Bosworth said. "They can grow longer than 10 feet in length and weigh more than 1,000 pounds. 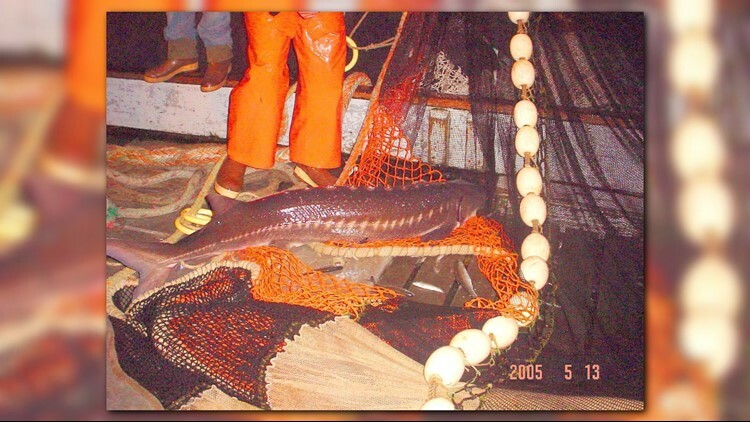 They also live a long time, and some sturgeon are known to be over 100 years old." Sturgeon are easily the largest lake-dwelling fish in North America and have few natural predators, which contributes to their massive size and longevity. One caught in Canada was believed to be 152 years old according to National Geographic. Sturgeon can migrate between freshwater and saltwater, but typically only return to freshwater to spawn. However, they aren't known to spawn in Lake Washington. Sightings there are especially uncommon since they spend most of their time feeding at the bottom. "That was a rare observation," Bosworth said. But he explained why the fish might be at the surface: "That whole northern end of Lake Washington is like a flat bench that is somewhat shallow relative to other areas of the lake where it’s really deep or drops off quickly. I think sturgeon may have good success foraging in that flat shallow area for the crayfish, fish, and shellfish." 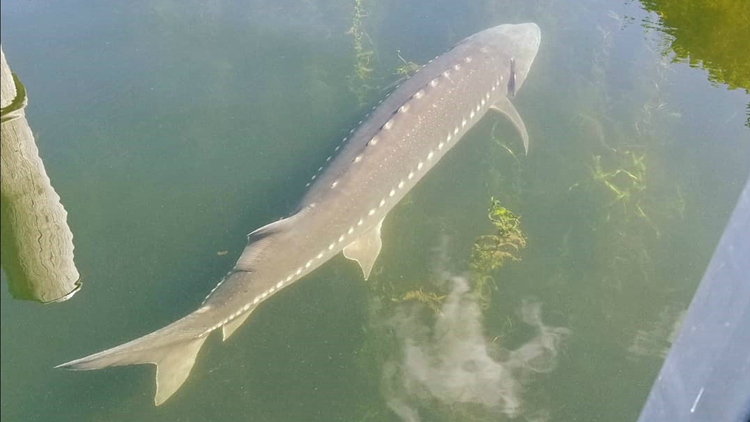 Sturgeon spotted in Lake Washington in July 2018. Photo: Jennifer Cochran. July's encounter adds to folklore about the 'Lake Washington Monster' that dates back for decades. A Facebook photo shared by the group Vintage King County Washington shows a massive sturgeon filling the bed of a pickup truck after researchers determined the fish had likely died of natural causes. The fish was estimated to be an 11-foot, 900-pound female, around 100-years-old. The post said the fish could have come from a fair held in 1909 at the University of Washington, when several sturgeon were released into the lake. Another white sturgeon was snagged out of the lake by UW biologists during a test fishery in 2005. It was 5.5 feet long and 100-120 pounds. White sturgeon snagged by UW biologists in 2005. Photo provided by Washington Department of Fish and Wildlife. Bosworth points out that not much is known about the habits of local sturgeon, due to their bottom-dwelling behavior and relative rarity in the Pacific Northwest. But a mass stranding event from 2009 brought hundreds of the giant fish into plain sight. Nearly 1,500 white sturgeon were stranded in shallow mud flats in Port Susan Bay near Stanwood. Biologists believe the sturgeon were trying to feed when the tide dropped and trapped the fish in shallow channels. About a dozen sturgeon died, but most swam back into Puget Sound when the tide came back in several hours later. 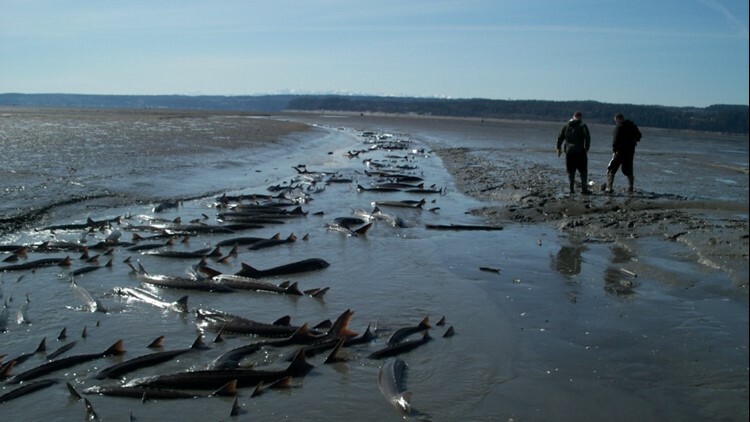 Sturgeon mass stranding event in Port Susan, near Everett in 2009. Photos provided by Washington Department of Fish and Wildlife.